Valueing every graduation as a "milestone" in every life of the graduates, Education Secretary Br. Armin Luistro FSC informed that everything which involved in graduation exercises shouldn't be extravagant. The Department of Education recently issued Order No. 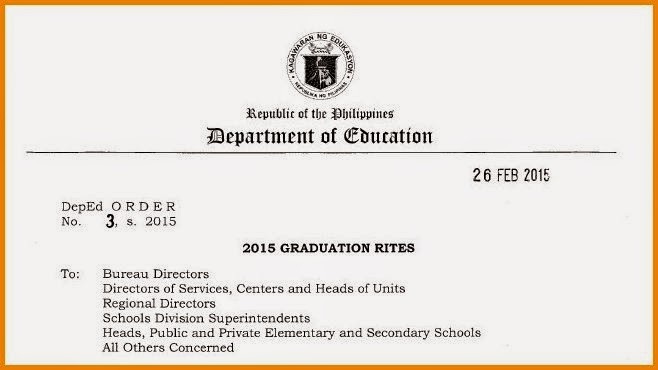 3, series of 2015 on Graduation Rites to answer query on this year's graduation theme. “Saktong Buhay: Sa De-kalidad na Edukasyon Pinanday” is the theme for 2015 graduation rites, the Order said. Graduation ceremonies should be simple. School Maintenance and Other Operating Expenses (MOOE) on the 2015 budget as directed by the said order should be used for Graduations expenses of the school. Graduation ceremonies shouldn't serve as a political forum. 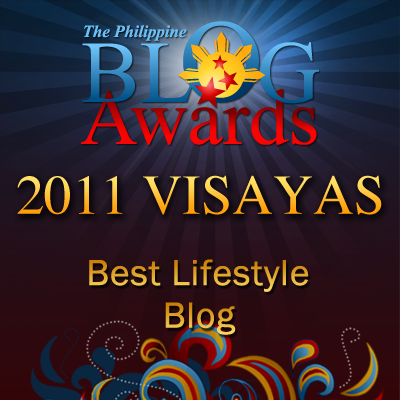 "No excessive spending, no extravagant attires, no extravagant venues," Secretary Luistro emphasized. Annual yearbook contribution isn't obligatory. It should be voluntary. Graduating pupils shouldn't be required to participate in field trip, JS Prom and other school related activities for their graduation requirements. March 26 or March 27 may be used for graduation activities of every school . I heard our school's assistant Principal mention this theme a few days ago. I hope Dep-Ed will make education in the Phililppines of good quality. Why did the parents agree to contribute? If your school is a public one, there is a source of fund for the pupil's graduation exercises. According to the PTA, they don't have funds. So we have to DONATE(that is the word they want to use) not CONTRIBUTE. It would be great if schools invites successful alumnus to give a speech on their graduation day instead of inviting politicians. But yes, they, politicians are not excluded to this order. They would not conduct politics, they're just there like a wall poster for the next year's election. It's right to keep graduation ceremonies and celebrations simple because the right battle and fight in life comes just after that. It's okay to just spend a good meal with the family. Graduation day happens once in a life time, so, though DECS wanted to avoid expensive grad. rites, Parents deemed it otherwise. Spend not much but enough that their kids will have a happy memory of their graduation day. The teacher of my daughter called a meeting about the upcoming graduation. They raised the concern about the possible expenses and it;s good to know that they are not asking for any payment. What they did say is that, if we can at least donate some amount or even help at the graduation event itself, it will be highly appreciated. I hope this of DepEd will push through, I hope they are serious about this because I believe there are still schools that requires students from participating to school activities. This is nice that they are setting guidelines for graduations. The focus is on the graduates and not on extravagant outfits and political topics. "Graduation ceremonies shouldn't be serve as a political forum." Hopefully, it's not or might as well school should not invite politics during the graduation so students can have the time of their life and not just listening to politics' whatnot.